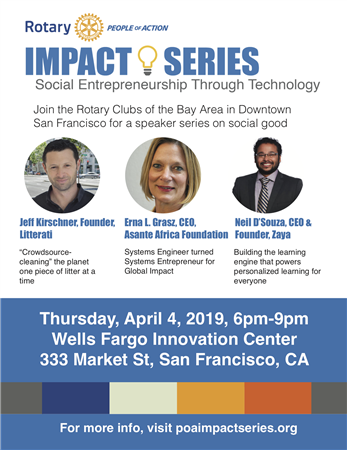 At the People of Action - Impact Series event in San Francisco, join guest speakers from Litterati, Zaya Learning Labs, and Asante Africa to discuss how the use of technology can effect social entrepreneurship. They will also discuss how you can utilize philanthropy throughout your career to enhance your individual development. You will have the chance to meet our speakers during a Q&A panel and connect with fellow attendees during a reception with passed hors d'oeuvres, local craft beers, and other beverages. Rotary, the main sponsor of this event, connects people with diverse perspectives to exchange ideas to change the world. At People of Action - Impact Series, we will bring together leaders from the Bay Area and the global Rotary network to explore opportunities to develop ourselves—and our communities.